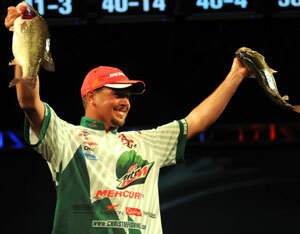 GREENVILLE, S.C. (March 27, 2011) – Diet Mountain Dew pro Jason Christie of Park Hill, Okla., caught a five-bass limit weighing 14 pounds, 13 ounces Sunday to lead the tournament wire-to-wire to win his first Tour title as well as $125,000 at the Walmart FLW Tour on Lake Hartwell presented by Chevy with a four-day catch of 20 bass weighing 70-11. The final day of competition started slowly for Christie. He made a run down the same area in Beaver Creek he had fished the previous days of competition and didn’t have a bite at almost 10 a.m. Christie stuck with his game plan, however, and relocated to another spot in the same creek. Christie said he caught most of his keeper fish in Beaver Creek with four coming during the second day from Shoal Creek. Christie said he caught one fish by flipping a YUM soft plastic bait the second day of competition, and said 75 percent of the rest came on a BOOYAH spinnerbait and the others on a YUM F2 Mighty Bug. Christies’ rigs consisted of Falcon rods, Quantum Smoke reels and 20- and 25-pound-test Silver Thread Fluorocarbon line. “The spinnerbait has taken a lot of trial and error with me,” Christie said. “The BOOYAH ½-ounce spinnerbait has a single willow blade on it and the wire is light, so when you throw it, it has the same vibration as a (BOOYAH) Boogie Bait. It has a thumping vibration. And the fish – pre-spawn, spawn and post-spawn fish – they like that vibration. Christie opened the tournament on Thursday with five bass weighing 22-4. On Friday he added another five bass weighing 20-4. He then caught five bass weighing 13-6 Saturday to make the crucial top-10 cut in first place. Christie’s final day catch gave him the win by a 10-pound margin over National Guard pro Brent Ehrler of Redlands, Calif., who caught a total of 20 bass weighing 60-11 and earned $35,000. Overall there were 46 bass weighing 111 pounds, 12 ounces caught by pros Sunday. The catch included nine five-bass limits. J.R. Wright of Truckee, Calif., won the Co-angler Division and $25,000 Saturday with a three-day total of 15 bass weighing 40 pounds, 9 ounces followed by Moo Bae of West Friendship, Md., in second place with 14 bass weighing 33-0 worth $7,500.